Public Market Newington, Lunch, Grinders, Meat, Italian Cuisine, Catering. 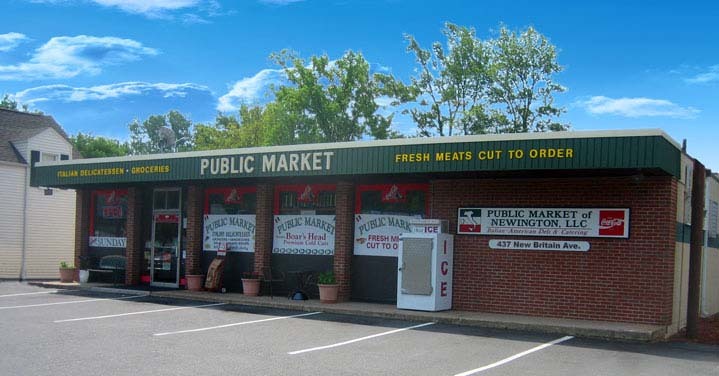 Public Market of Newington has proudly offered the finest meats, a superior deli, outstanding catering and the finest imported specialties in Hartford County. We offer a large variety of imported items you simply cannot find in large grocery stores. Fresh Italian bread and rolls are delivered daily to our store. We have a large selection of imported Italian pasta and feature olives imported from all around the world. We proudly feature the finest pre-cut cheeses and grated cheeses, including imported Parmigiano Reggiano. Located in Newington, at 437 New Britain Avenue, Public Market of Newington caters to all who appreciate the best—from imported Italian items, premium cold cuts (such as Boar's Head), fresh cut meats, as well as authentic second-to-none Italian sausage. For lunch, Public Market offers true Italian cold cut grinders, sandwiches, soups and salads.